“What’s in a Monument?” is based on a public lecture delivered on March 11 in the History Matters Series organized by the University of Calgary History Department and the Calgary Public Library. This first post by Jewel Spangler is about the attempted removal of the Robert E. Lee monument in Charlottesville. Tomorrow’s post by Nancy Janovicek focuses on the Edward Cornwallis monument in Halifax. Last weekend marked the one-year anniversary of the Charlottesville Riots. 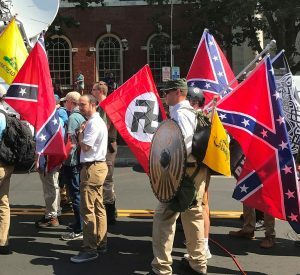 In the run up to a white-nationalist “unite the right” rally that had been planned in that southern college town for the afternoon of August 12, 2017, skirmishes between white supremacists and counter-protestors became such a threat to public safety that Virginia’s governor ended up declaring a state of emergency and local police proclaimed the assembly illegal before it could officially begin. Clashes ultimately resulted in the death of counter-protestor Heather Heyer and injuries to 19 others when one of the white-supremacist ralliers intentionally rammed his car into a crowd. Comments like these rest on several well-documented fallacies. Most obviously, they mix up history (that which took place in the past) and commemoration (an effort to insure a particular remembrance of past things). Monuments do not tell us objective facts about the actual past. They tell stories that reflect the perspectives of those who commission, pay for, allow, and craft monuments. They are artifacts of those who commemorate. The term “heritage” or “culture” is often invoked with respect to historical monuments, and is particularly common in defense of U.S. Civil War commemoration. In heritage storytelling, explains historian Fitzhugh Brundage, “groups . . . fashion their own image of the world and their place in it by establishing an accepted version of the past, a sort of genealogy of identity.” Such stories do not necessarily arise from careful research, and are sometimes entirely at odds with it. By erecting monuments, groups plant those heritage narratives in public spaces, to “exert the cultural authority, express the collective solidarity, and achieve a measure of the permanence that they often crave.” In other words, heritage stories do cultural work for a particular subset of society, they aren’t the whole or the people’s story. The president’s tweets imply that the united whole of the commemorated past is fractured by those who criticize the public presence of certain monuments. Yet most monuments are themselves products of conflict, not unity. Even in the most seemingly homogenous groups, people engage with the past from a range of perspectives. Hammering out a narrative that will be tolerated by enough people that a commemorative act can go forward is often a difficult process — there are and always will be people whose views are rejected along the way. Commemoration also privileges groups and individuals who have some sort of social and economic power, those more likely to be able to secure the resources to commemorate. To the victors go the spoils in stone, while silence envelops everyone else. 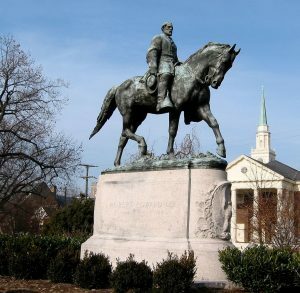 An outsider might find it difficult to understand why Charlottesville’s seemingly bland sculpture of Lee astride his horse inspired such passion last year. For answers we should probably start by looking back to the time of its placement, to ask about what was intended, whose needs were met, and what was left out by the monument. In the immediate aftermath of the U.S. Civil War, Confederates had tremendous losses to make terms with. Over the next several decades, former Confederates and their descendants and supporters gradually worked out ways of remembering the conflict that allowed them to come together and ease their pain by finding honor in defeat. In sum, they developed a heritage story. The various elements of that story, labeled the “lost cause,” comprise a defense of the southern war effort as based on high principles, noble leadership, and brave fighting men, and expressly not waged in defense of slavery. Academic historians take issue with every single point of the lost cause narrative, but no amount of historical evidence has been able to shift it very much among true believers in the general public in the last century. Various groups formed across the South in the late 1800s that adopted the lost-cause narrative and worked to preserve and disseminate it — most famously the United Daughters of the Confederacy (UDC) and the Sons of Confederate Veterans (SCV). According to a Southern Poverty Law Centre report, over 1,500 places and monuments in the U.S. now honor the Confederacy in some respect, largely the work of such groups a century ago. The Lee monument in Charlottesville is an example of their work. It may have been commissioned and paid for by Charlottesvillian businessman Paul Goodloe McIntyre, but the dedication ceremony was combined with a meeting of the SCV and a reunion of Confederate veterans, with the UDC helping to organize the event. Reverence for Lee as an honorable fighter and gifted leader was of course central, but assembled crowds also heard a series of speeches defending the lost cause of the Confederacy more generally. For example, one speaker proclaimed that the audience could: “see the day rapidly approaching when these stately monuments, . . . there will be cherished, sacred and hallowed memories of the principles and virtues for which their fathers fought and died. . . . And what shall I say of the righteousness of the Cause for which they sacrificed all[?] . . . We answer, justification under the constitution is our defense. There we leave the Cause with the unbiased historian who will, in time, accord us due mead of praise and an honorable verdict” (p. 15). Fixing this monument in place was intended to and did exclude those who might have had a different perspective on the war, most especially African Americans. Lee’s monument was located in a segregated park that they could not even enter until the late 20th century. In that age of disfranchisement and lynching, former slaves and their descendants didn’t have the option to safely voice dissent from the argument that Lee was everyone’s hero or that the cause was not based on the defense of slavery. In the last few years a modest movement to challenge Confederate memory, symbols, and monuments has turned more vocal and visible, with African Americans leading the way. After the senseless deaths of Trayvon Martin in Florida in 2012 and Michael Brown in Ferguson, Missouri, in 2014, Black Lives Matter emerged as a national force. Then a neo-Confederate, white-nationalist teen shot and killed a group of people in an African American church in Charleston, South Carolina. The shooter’s visible attachment to the Confederate flag and passionate hatred of groups like BLM prompted an outcry to remove Confederate symbols that were associated, now more undeniably than ever, with white supremacy. In Charlottesville, members of the public urged the City Council to do something about local Confederate monuments. The council commissioned a study in 2016 and then decided, in a close vote, to move Lee’s monument and others to a location “as yet to be determined” in early 2017. The SCV and other Confederate-monument supporters quickly filed a lawsuit to keep the sculpture in place. Into this setting, white supremacists inserted themselves, chanting support for the Charleston shooter, waving Confederate flags, and proclaiming that whites were here to stay. In the end, Confederate monuments present Americans with a problem of such magnitude that it is hard to imagine a clear way forward. As the history of Charlottesville’s Lee sculpture itself demonstrates, these monuments are the product of an active reworking of the past for the benefit of a particular, relatively powerful subset of Americans. The lost-cause interpretation of the US Civil War is highly controversial because it so thoroughly excludes the perspectives of so many, and particularly those of descendants of the enslaved, for whom Lee was certainly no hero and the cause anything by noble. Now that unapologetic white supremacists are so publicly defending Confederate monuments and symbols, southern heritage groups are finding it increasingly difficult to gloss over that part of their history. Yet deciding the fate of Confederate monuments and memorials, across hundreds of jurisdictions, will be anything but a straightforward enterprise. Jewel Spangler is Associate Professor of History at the University of Calgary. She is the author of “Slavery’s Archive, Slavery’s Memory: Telling the Story of Gilbert Hunt, Hero of the Richmond Theatre Fire of 1811,” forthcoming in the Journal of the Early Republic. We acknowledge the traditional territories of the Blackfoot and the people of the Treaty 7 region in Southern Alberta. These are the traditional territories of the Blackfoot and the people of the Treaty 7 region in Southern Alberta. This includes the Siksika, the Piikuni, the Kainai, the Tsuut’ina and the Stoney Nakoda First Nations. The City of Calgary is also home to Metis Nation of Alberta, Region III. Karen L. Cox, Dixie’s Daughters: The United Daughters of the Confederacy and the Preservation of Confederate Culture (Gainesville: University of Florida Press, 2003). Gary W. Gallagher and Alan T. Nolan, eds., The Myth of the Lost Cause and Civil War History (Bloomington: Indiana University Press, 2000).